When manufacturers unveiled the first Windows 8 tablets, convertibles and two-in-ones, customers mourned a distinct lack of small screen sizes. A few 10- and 11-inch Windows tablets emerged, but far too often, the only choice was a 13-inch display that separated from a keyboard dock in an attempt to convince us of its tablet-ness. That era appears to be on the wane. Dell and Acer finally downsized and debuted 8-inch Windows 8 tablets last year, and now small slates from Lenovo, ASUS and Toshiba have joined the party. Is Windows 8 too much for a tablet? 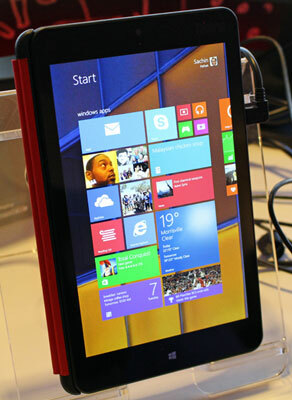 The smaller Windows 8 tablet trend seems to be following a trajectory similar to iOS and Android tablet development. Those devices also started out big, eventually gravitating to more holdable sizes. The difference is that iOS and Android tablets were designed with a mobile mindset, whereas Windows tablets still betray their desktop PC roots. The 8-inch screen size may be ideal for a portable tablet, but is it too small for a mature operating system like Windows? If you choose to operate using the touch-centric Windows 8 interface, a small screen size isn't any more of a problem for Windows devices than it is for Android tablets or the iPad mini. Once you switch to a desktop app, though, a problem emerges: How should the tablet deal with tiny icons and elements not built specifically for touch? ASUS' solution on the newly announced VivoTab Note 8 is a pen. The pen utilizes the same Wacom technology as the Galaxy Note series to provide precise strokes, advanced input and mouse-like features such as hovering. The VivoTab's implementation is better and more robust than the pen on the Dell Venue 8 Pro, which uses a different (and in some cases inferior) underlying stylus technology. Still, both ASUS and Dell seem to feel that Windows 8 is better with a pen, at least at this screen size and particularly if you want to get work done. Can they work as well as play? What the VivoTab and the Venue 8 both lack is a display output or desktop docking solution. Dell does include docking capabilities on its 11-inch Windows 8 tablet, but company reps have told me more than once that the small tablet's customers aren't interested in docking it as a workstation. Lenovo has a different opinion. Its new ThinkPad Tablet 8 has a micro-HDMI out and a micro-USB 3.0 port. With the USB 3.0 port, the Tablet 8 can send output to two HD monitors and connect to multiple peripherals, including a mouse and keyboard. That setup may seem like overkill for a small tablet, but it makes sense if you think of the tablet as a mobile workstation. Lenovo chose the most high-end of Intel's quad-core Bay Trail processors for the ThinkPad Tablet 8, claiming that this chip is powerful enough for moderate multitasking without overheating or compromising battery life (two important considerations on a thin, handheld tablet). As good as Intel's Bay Trail processor seems in short demos, can it perform well in the real world? That's the Achille's heel of the small Windows 8 tablet market — the chips have to balance energy efficiency and power with little margin of error. If Intel or AMD can help tablet makers pull this off, then the small screen size won't really be a limitation for Windows. You'll either be able to connect to a big screen or use a pen for small elements, taking notes and navigating the system. 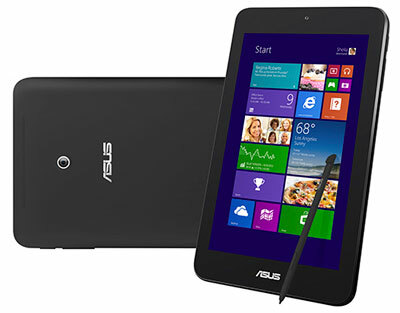 The ASUS VivoTab Note 8 will be available in late March 2014 at $299 for 32GB of internal storage. Given that it runs the full Windows 8 and not RT, the best choice is to opt for the $349 64GB version. The Lenovo ThinkPad Tablet 8 comes out in just a few weeks, costing $399 for 64GB of internal storage. A 128GB version will also be available. Of these two tablets, I'm most impressed with the ThinkPad and its accessories, and I can't wait to see if it works well both as a workstation and as a tablet. However, I am a big fan of pens, so I hope that the VivoTab's writing experience will prove to be as good as the performance I'm used to on Samsung Note tablets. I saw the Lenovo thinkpad 8 has dual microphone, which is a great feature. Do you know if the Asus Vivotab 8 will too?